Mitchell Starc or Josh Hazlewood for first Ashes Test? Among many questions heading into the upcoming Ashes series is that of Australia’s third pace bowler. Who will be in the side in just three weeks’ time with the first Test beginning in Cardiff? It would appear pretty clear that Mitchell Johnson will continue to spearhead this attack. Who could forget the way he tormented the English in the most recent 2013-14 series? He still regularly touches speeds above 140km/h, and is one of the most feared quicks in world cricket. Partnering him with the new ball should be Ryan Harris. The big-hearted quick is still the best bowler in the country. His accuracy and consistency makes him such a lively prospect. In the matches he played in the 2013 series away from home he showed just how dangerous he can be with the new ball in hand. So, who joins Johnson and Harris to make up the pace battery for the first Test? Mitchell Starc is a changed man after his unbelievable ODI World Cup form which saw him lead the tournament with 22 wickets. His ability to snuff out even some of the world’s top batsmen with an unplayable yorker was something special. We have seen a remarkable improvement in Starc’s attitude and fitness in the past few months. Most recently, the 25-year-old tore through the West Indian top order in the two-Test series, claiming ten wickets from two matches. Starc can still be a little wayward at times, but is undoubtedly a genuine wicket-taker. While Josh Hazlewood offers slightly more control and accuracy, Starc has him covered in terms of sheer pace. Will Australia be happy to play two left-arm tearaway quicks in Johnson and Starc, or will they prefer a more steady approach with Hazlewood’s sharp and precise bowling? 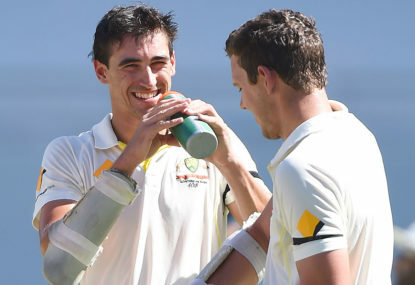 Both the quicks from New South Wales push just about an equal claim to the Test side as one another. It just appears that right now, both simply cannot fit into the one side. Hazlewood has drawn comparisons to Glenn McGrath. He gives very little away, and, unlike Starc, you won’t see him bowl too many loose ones. His good pace and bounce has fastracked him into the Test arena, and there is a bright future for him. He bagged 12 wickets against the West Indies, and showed plenty of upside when making his debut against the Indians late last year. It appears an interesting one for the selectors. Given the form of Johnson, Starc and Hazelwood, you wish you could pick all three. Ryan Harris mightn’t play all five Tests, and should he not, then there’s your pace attack. But while Harris is still fit and bowling well, I think he is a certain starter. In this respect I think the slightly safer and more balanced option would be to select Josh Hazlewood, I think he will get the nod and be lining up in the first Test.